Artist Sherrie Levine is best known for her 1979 series, After Walker Evans, in which she rephotographed Depression-era images by Walker Evans and presented them as her own. With this series, she posed questions about authorship and originality that would remain central to her art production: What is an original work of art? What is a copy? To me, Levine’s work hints at another interesting idea: How do we learn about art? Levine grew up and attended college in the Midwest, miles away from the mainstream art world. In a 1985 interview the artist revealed that her early experiences with art involved “seeing everything through magazines and books.” To create After Walker Evans, she didn’t take snapshots of the original Evans photographic prints, but instead photographed the images from an exhibition catalog. While museums and galleries allow us to experience art directly, much of what we learn about art is indirect. Most people can recognize da Vinci’s Mona Lisa and Vermeer’s Girl with a Pearl Earring without ever having traveled to Paris or the Netherlands. Today, in addition to magazines and books, we also learn about works of art through the internet. A spate of recent websites and mobile applications, such as Artsy, ArtStack, and Curiator, allow users to aggregate virtual collections of art. The missions behind such websites often have a democratic impulse, making works of art accessible on the web and transforming users into art collectors. As a museum educator, I am all for democratizing the art experience, but I wonder if we’re asking the right questions. What the internet affords us is a wealth of art images at our easy disposal, and web projects like Artsy allows us to cull through them in one place. But how, then, do we create meaningful experiences from these images? How do we get people to look closely, think critically, and engage in conversations with others about a work of art? Additionally, the majority of the works of art being shared, collected, followed, and Tweeted on these platforms were intended to be experienced in person. While the internet can be a great tool for first forays into learning about art, it doesn’t replace witnessing an artwork firsthand. How can our online art dabblings connect us to onsite art experiences? These are some of the issues I’ve been thinking about as a new research assistant in HyperStudio. Digital media can provide new ways to discover art, but the best experiences are the ones that put you in direct contact with a work of art. And that’s why we’re starting local. I’m working with the HyperStudio team to develop a digital tool that provides an easy way for Boston-area residents to access information about artworks, exhibitions, and events. But we also want to be more than a mere listings or image-aggregating website, instead asking: what are the as-of-yet-unearthed art threads happening in the Boston area? 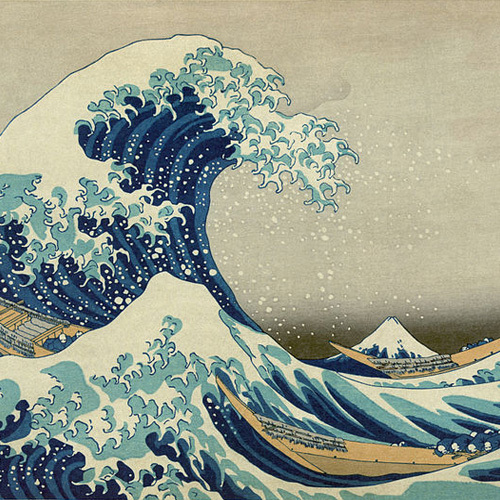 For example, let’s say you see the print Under the Wave off Kanagawa by Hokusai at the Museum of Fine Arts and are immediately enamored. Our tool might connect you to a workshop on woodblock printing led by a local artist or inform you about a lecture at Harvard about Edo period Japan. The principles underlying this new project is a concept that runs through many HyperStudio endeavors. For example, Annotation Studio is an open source web tool that aims to enhance the ways a student interacts with a text. A student can add multimedia annotations onto a text, search and link to other content, and ultimately engage in a more active reading of the text. The digital tool doesn’t overshadow the original text, but is instead an avenue to dig deeper into it. Like Annotation Studio, the goal of our new project is to privilege engagement with the art first. Over the next few months, we will be researching into how digital tools might allow us to create meaningful art experiences through out the Boston area. We have started by looking into what examples are already out there, from event listings to museum collection guides. Ultimately, we want to go from looking at images online to fostering rich, direct experiences with art. For Sherrie Levine, books and magazines were a medium through which she experienced art, far away from art world centers. Here in Boston, we’re lucky; we have many world-class museums and intellectual centers at our disposal. We hope that our tool will be a way to connect the community to these onsite experiences. Like Levine’s books and magazines, this project will be a first step to learning about art—but it won’t be the last.